I was not sure whether to call this a soup or a stew. There are so many vegetables in it that it eats more like a stew. It is filling and delicious and you can eat a large portion without feeling guilty. It’s simple and quick to make. Sauté some onions in a little olive oil, add garlic, a sprinkle of hot pepper flakes, and an herb. Add carrots, celery, tomatoes, a can of rinsed chickpeas, and a couple of cups of chicken or vegetable stock and a couple of cups of water. Bring to a boil. Add a small pasta like orzo or ditalini. When the pasta is al dente stir in some greens. I used an arugula/kale salad mix. Season with salt and pepper to taste. When the greens wilt, you’re done! Note: For a thicker consistency you could take out a cup of the chickpeas and vegetables with a little of the broth, whiz it up, and then stir back into the soup. 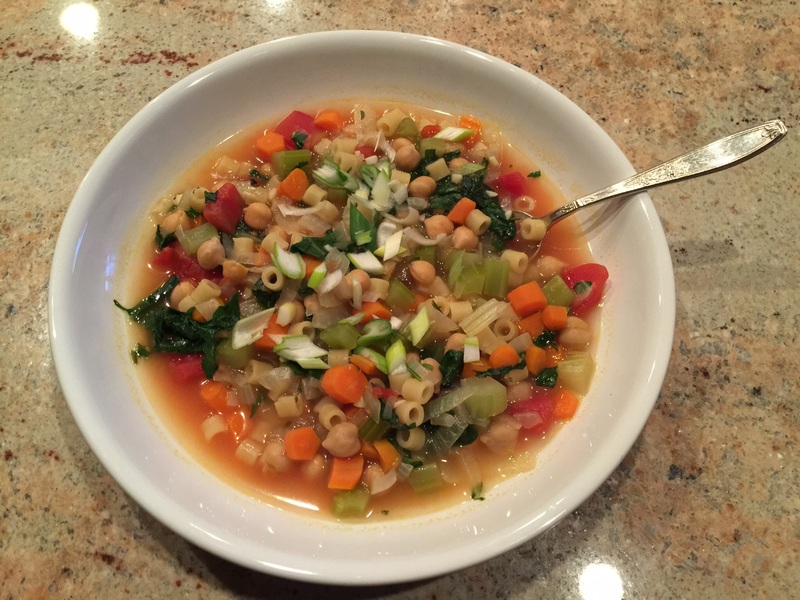 This entry was posted in Vegan, Vegetarian and tagged arugula, chickpeas, ditalini, garbanzo beans, kale, orzo, Vegan, vegetable soup, vegetarian. Bookmark the permalink.